While in theory the internet is supposed to be free and open to everyone, sadly there are a lot of reasons why that isn’t actually the case. You may live in a country where your government restricts access to certain websites or applications, or you could just be trying to access geo-blocked content (perhaps a live stream of sports game or a broadcast of a TV show only available in a certain country). At times like that, you need a VPN. And if you’re on your Android mobile device, you need a VPN app. That’s where Cloud VPN PRO comes in. Why Use Cloud VPN PRO? You need to hide your IP address to protect your privacy as you browse and conduct other activities online. You want to unblock a website which is inaccessible in your country or region (BBC if you’re in the USA for example). You need to get by a filter or firewall while you’re on a school or company network. This VPN is designed specifically for the Android operating system. If you need something for iOS, Windows, Mac OS, Linux, or another operating system, you will have to download something else. 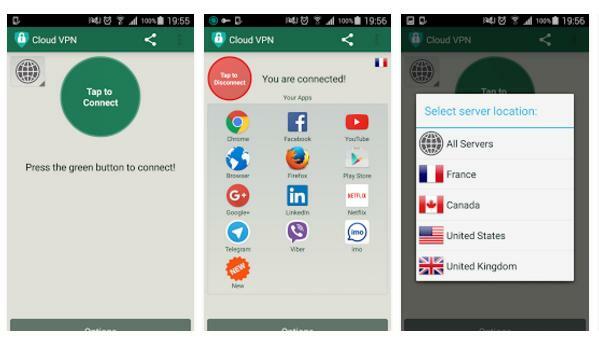 You can use Cloud VPN PRO on any mobile device so long as it is running Android. It is compatible with WiFi, 3G, 4G, and all mobile carriers. Can you use Cloud VPN PRO for free? Sadly the answer to this question is “no.” You used to be able to use Cloud VPN PRO for free; in fact, at one point of time it was an entirely free app. But those days are gone, and Cloud VPN PRO is now a paid app only. On top of that, it is ad-supported. This new paid version is referred to as the “PRO” version. Previously, the app was just called “Cloud VPN.” There is no free trial. If you want to use Cloud VPN PRO, you have to pay a monthly subscription fee. Currently the price is listed at $3.99 per month. Browsing the reviews for Cloud VPN PRO, you will notice a lot of anger over this issue. It is hard to tell at a glance whether this is because the VPN really is not worth $3.99 per month, or whether people who enjoyed the free version before simply feel cheated because of the changeover to a paid model (which was apparently done because the VPN was being “abused”). In any case, there are some people who will never pay for a VPN. So if you are searching for free, this isn’t it. If however you are willing to pay for a VPN, Cloud VPN PRO may be worth a closer look. You need to start out by downloading the app to your Android device. Once you do that and pay to get started, you’ll be able to access the user interface and connect. As you’ll discover, it could not be simpler to use this app. There is a big green button which says “Tap to Connect.” You tap on the button, and you will be given a list of server locations from around the world to choose from. Once you pick your server, you can go ahead and connect, and you will be browsing online privately. Click on any of them and you can go straight to those apps. This quick navigation is very helpful if you are on the go and only have a few minutes to get online. Want to disconnect from the VPN? In the upper left corner of the same screen is a big red button which says, “Tap to Disconnect.” Do so, and you will be disconnected. This user interface really is as straightforward as it could get. Even if you are totally new to VPNs and you have no idea what you are doing, you should be able to figure out your way around the screens quite quickly. On the whole, Cloud VPN PRO seems to be a fairly stable service. You may still notice some buffering, and your speed for both uploads and downloads will decrease while you are using it. This is not unusual for a VPN, though it is not particularly desirable, and may not be the best for applications such as streaming and gaming. It should however be fine for browsing and emails. You also may find that you are still good to go with streaming—you may just need to check a few different servers to find one which is sufficiently fast. Some people report great experiences with speed while others report speeds which are less than ideal. Cloud VPN PRO had an excellent reputation back in the days when it was just “Cloud VPN” and it was free for everyone. A lot of users who are griping about the move to “PRO” complain that it was a perfect app before they had to pay for it. Just going by this, we can ascertain that Cloud VPN PRO probably still is a good service, if you are willing to pull out your credit card. Companies do have to make money, and no one is really “entitled” to a free VPN of a high caliber. That said, making it a paid service while still serving up ads seems a bit excessive. Curiously enough, just a week ago (as of the time of this writing), users were complaining not only about the app being paid, but about the company stating it was “free” on the download page. If this really did happen, obviously that is not cool. But it is fixed now. The page clearly states, “Please note that Cloud VPN PRO is NOT a free service.” So only download it if you are planning on paying for it. There are not a lot of reviews mentioning customer service for this app, but there is an email address listed if you want to contact the developers directly. It would be easy to condemn Cloud VPN PRO on sight because of the recent spate of 1-star reviews. When you see such a slew of complaints, it makes you wonder whether this is a terrible developer and whether their app can possibly be worth it. But if you read the reviews carefully, you will notice that a lot of them are from people who make it very plain they would never pay money for a VPN. A few of these users have even made it clear that they are youngsters without credit cards. If you are in that camp, obviously this is not the VPN for you. If however you do not find it unreasonable to pay for a VPN (and you shouldn’t, because it is a useful service), you might still want to think about Cloud VPN PRO. There is no way to know exactly what has gone down with Cloud VPN PRO, but if indeed the deluge of negativity is coming from people who would condemn any paid VPN, it is unfair and unreasonable to judge Cloud VPN PRO by their standards. If you are looking for a VPN which will work on multiple devices, this also is not the right option, and you’d be better served looking into Cloud alternatives. But if all you use is Android and you just want something simple and easy to use with a reasonably small monthly cost, Cloud VPN PRO might work out for you. Make sure you read the fine print and understand the terms of service for the monthly subscription before you pay since there is no free trial.